As we transitioned to afternoon session it looked like a completely different day on Lake Pardee. The sun was out and this allowed for even greater visibility. There were some parts of the lake where the water looked downright tropical. 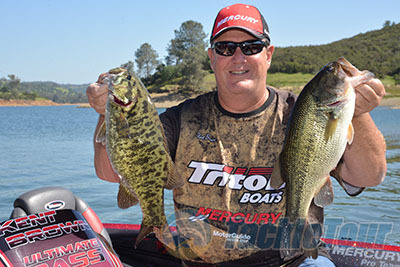 We bid farewell to Double G and loaded our gear into Jason Borofka�s boat. Jason is a an up and coming pro that had a great year last season on the FLW Everstart Trail, with a season high second place finish at Clear lake on his way to a 3rd place finish in the points race. He then kicked off this season with another second place finish at Lake Havasu. On this particular day at Lake Pardee we would be fishing with �Team Borofka� which included Jason and his wife Tara, who is also a talented angler and will be fishing co-angler side a few times this season as well. 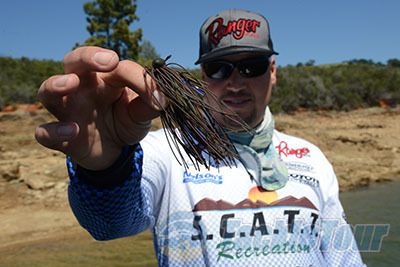 Jason's favorite jig? The full bodied Johnny C Mop Jig! 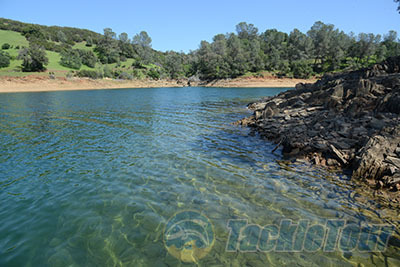 It didn�t take long for us to understand just how much Jason and Tara love the sport of fishing. I think the fact that Jason proposed to Tara on the deck of his bass boat pretty much says it all. Jason�s approach to Pardee was different than Double G�s. He was boating fish using good old fashioned senkos, fished wacky style on spinning gear. Casting real tight against the rocky structure he was not only getting bites but landing fish in the 2lb. class at just about every stop on the lake. Though there wasn�t a whole lot of �stopping� going on. Jason is the definition of a power fisherman and his approach is to hit spots hard and fast. If there are no bites he moves on to the next spot and repeats the process. 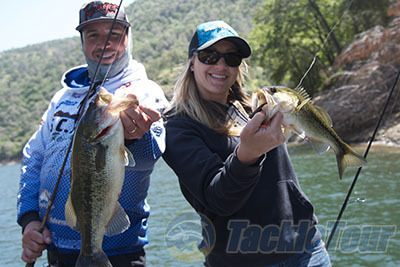 In the clear water of Pardee Tara fished a Senko rigged wacky weighted with a nail and this was also proving effective. 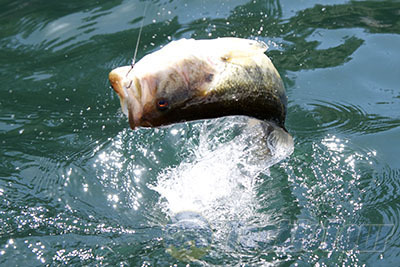 In a tournament situation they typically fish different but complimentary styles, but it was clear that Tara was also used to fishing quickly to maximize casts in each location. Jason also targeted fishing using an umbrella rig, and his favorite is the �Crazy 8� made by Hi�s Tackle Box in San Francisco. He has a well-deserved reputation as a big bait angler and loads up on his arsenal at Coyote Bait and Tackle which carries a variety of his favorite custom swimbaits, and on his boat were some of our favorites including the Deps Slide Swimmer. Even though he clearly enjoys fishing big baits when it came to catching fish in the clear water at Lake Pardee he was quick to adapt to more finesse oriented techniques and this paid off in a high number of 2-3lb. fish caught in a short amount of time. In a tournament situation this would give Jason the luxury of turning back to those big baits he loves so much and focusing on catching that kicker fish. Watching Jason and Tara fish and interact on the boat was a pleasure, and there is no doubt in my mind that he is one to watch in the coming seasons as he is certainly hungry to break that 2nd place finish. Back at the dock we compared notes with other pros and media at the event. 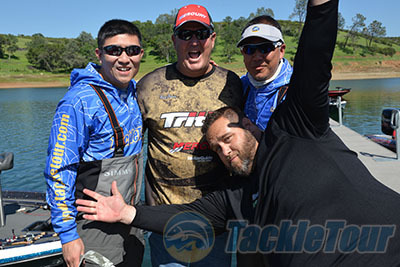 We met up with friends like Dan O�Sullivan of Advanced Angler and Jody Only and Mark Lassagne from Bass Angler Magazine. There were a number of nice fish caught but big fish honors went to Mike Reynolds, a bassing legend out here in the West, who landed a beautiful 10lb. largemouth on a drop shot rig. Once again proving you can catch some really big fish on really light tackle. As you might expect when you get a bunch of people that fish for a living and people that write about fishing for a living all in one place there are going to be plenty of fish stories and just the right amount of trash talk to keep things interesting. There are a lot of different personalities and yet we are all bound by that love of all things fishing. 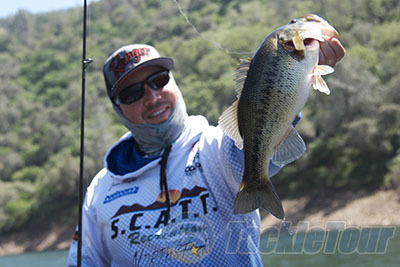 What really resonated for me this year were the different approaches to successfully targeting bass in clear water. On one side we had Double G representing the seasoned veteran angler patiently working spots in search of those big bites with Roman Made glide baits, and on the other side we have Jason Borofka representing the bassin� young guns power fishing his way to success. 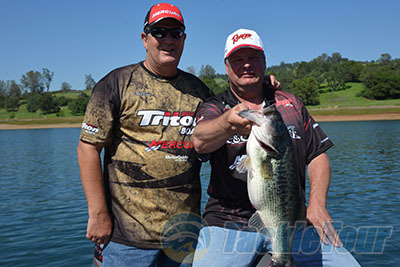 Lake Pardee once again proved to be a worthy stage for a showdown between the Pros and those elusive green fish, and on this particular day the conviction and adaptability of the pros was more than enough to conquer the clear water.